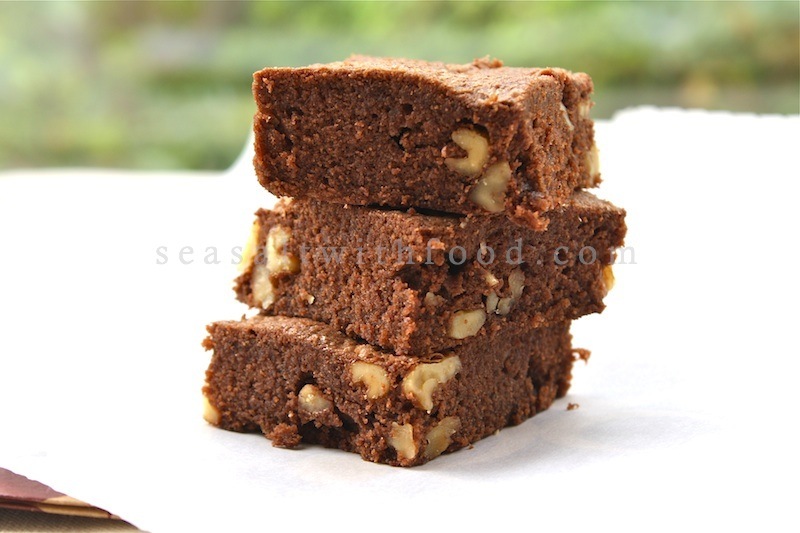 I have found a wonderful Brownies recipe and I’d like to share it with you. 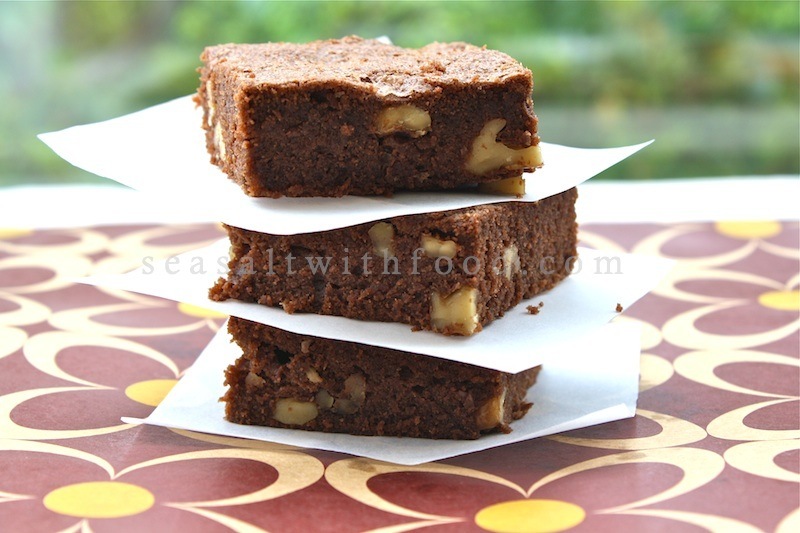 These brownies were very soft, moist, buttery, nutty, and chocolaty. I adapted this fantastic recipe from Chocolate Desserts by Pierre Herme. As usual, I reduced the amount of sugar called for by the recipe, I used 180g instead of 250g. The brownies still turned out great, not too sweet, just the way I like it. Butter a 9 x 12 inch (24 x 30 cm) brownie pan, line with parchment paper, butter the paper, and dust with flour, tap out the excess flour. In the top of a double boiler, melt the chocolate over gently simmering hot water, stirring, just until the chocolate has melted and remove from the heat. In a large bowl, beat the butter with a rubber spatula until it is smooth and creamy but not airy. Stir in the chocolate. Gradually add the eggs, and then add the sugar, followed by the flour and nuts, stirring only until each ingredient is incorporated. This is not a batter to be beaten or aerated. Scrape the batter into the pan and smooth the top with a spatula. Bake for about 19 to 22 minutes. If using 250 g of sugar, a knife inserted in the center will come out wet. Transfer the pan to a cooling rack and allow the brownies to cool for about 20 to 30 minutes. Then run a blunt knife around the edges of the pan and unmold the brownies; remove the parchment paper and turn the brownies over to cool to room temperature. When ready to serve, cut the brownies into 18 pieces. Looks delicious! I have yet to achieve success making brownies. Always turned out too dense. cheers! I think brownies are underappreciated and I'm so glad you put up such a bueautiful post about them!